It was a photo of people driving their goats down a dusty road that had the most impact on Paula Menzies. In the photo, taken just outside Mosul, Iraq last spring, people are fleeing for their lives from the battle between ISIS and Iraqi troops and taking their livelihood with them. Goats are a vital commodity in impoverished countries. They are an important source of protein to the poor in the most vulnerable countries, points out Menzies. These are typically women who raise the goats, using the milk for their children and income from the sale of goats for their family. But a devastating viral disease is targeting the goat and sheep population in these countries. Peste des Petits Ruminants (PPR) kills 70 to 80 per cent of goats who contract it. Goat kids are particularly susceptible. It can be difficult to identify, causing symptoms found in a multitude of animal diseases – pneumonia, diarrhea, mouth erosions, nasal discharge, and weepy eyes. First identified in western Africa in the 1940s, it has spread rapidly, most dramatically in the last ten years. Today it is in more than 70 countries, including most of North Africa, Turkey, Kazakhstan, Afghanistan, Israel, Pakistan, India, Nepal and into China. It recently was found in Mongolia where it wiped out 50 per cent of the country’s Saiga Antelope, an endangered species. It is not in North or South America yet, but its spread is alarming, says Menzies. It is also on Europe’s doorstep. Menzies first heard about efforts to eradicate PPR, when she attended an International Goat Association Conference in Turkey last year. One afternoon of the conference was devoted to the joint Food and Agriculture Organization (FAO) and World Organization for Animal Health (OIE)plans to eradicate the disease. To date, only two diseases have successfully been targeted and eradicated in the world, small pox and rinderpest, a viral disease in cattle. The FAO and OIE have established a PPR advisory committee, which Menzies chairs as well as representing the International Goat Association. The aim, to eradicate PPR by 2030. The initial committee is in place for five years. “Our job is to take a look at the things they are doing and proposing to do and provide advice,” says Menzies. There are many hurdles, both technical and socio-economic to navigate. Vaccination is an immediate priority but includes a number of challenges. There are effective modified-live vaccines, some of them are heat stable. But to achieve protection, the flock needs to be vaccinated two years in a row to ensure that kids and lambs born after the initial vaccine are protected while the virus may still be circulating. There are cultural implications to consider and education surrounding the disease will be crucial. Ongoing monitoring will be needed to check if the disease is present and then prove it has been eradicated. “It is one thing to develop a vaccine, it is another to get it out and administered in the regions that need it,” adds Menzies. Individual countries have tried in the past to manage the disease, but securing enough vaccine, along with ongoing migration of people and animals, often across international boundaries, proves challenging. “This is a concerted international effort which is what makes it different,” says Menzies. It has the potential to create immense impact. According to OIE numbers, PPR has a direct impact on over 300 million rural families who rely on small ruminants. 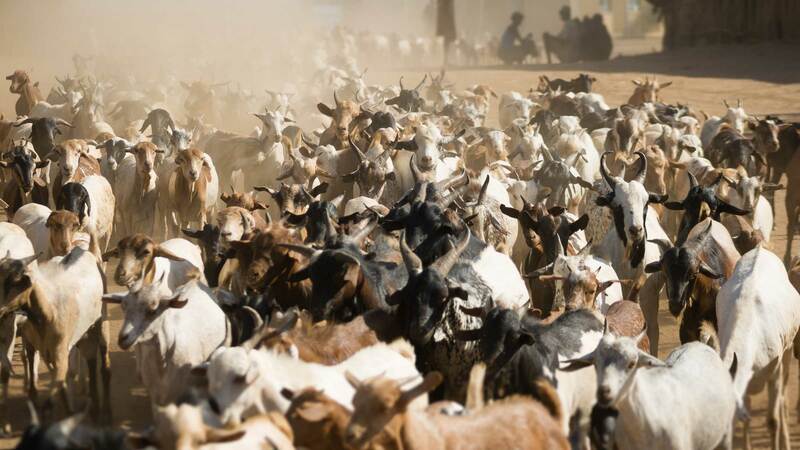 It occurs in regions where 75 per cent of the world’s 2.1 billion small ruminants are raised and causes loses of nearly $1.9 billion USD per year. The resulting loss of livestock increases social and economic instability and conflict, poverty, malnutrition and impacts food and nutrition security.